According to the government’s Make In India report, the wellness industry in India is worth Rs. 490 billion, and wellness services alone comprise 40 percent of the market. Estimates say that over 200 million people around the world practice yoga. The estimated market for yoga apparel in the US alone is over $13 billion (Rs. 82,000 crore) annually. According to a euromonitor.com report titled ‘Sportswear in India – Mar 2016’, there is a rising trend towards health and wellness amongst Indian consumers. Rapid urbanisation has resulted in a hectic lifestyle for Indians and consumers have become more health conscious and have added new routines to their lifestyle such as meditation, yoga, gym workouts, swimming and jogging. Sportswear is expected to continue to post a strong retail value CAGR of 12% over the forecast period with sales expected to touch Rs. 540 billion by 2020. According to Jainam Shah, Managing Director, Bhu:sattva, an organic clothing brand that has recently launched a yoga line, the wellness market is still in its virgin stages in the country. “It is still early days here but I am sure over the next 2-3 years, this market will pick up really well in the country. We have started with women yoga wear for now and work with breezy fabrics. Or focus is on woven fabrics as opposed to knits and these are breathable and easy to wear clothes like palazzos and pyjamas that are subtle and use natural fibres.” Super Sox has a wide range sock including sports socks; Titan, titan stripes, titan designs, titan argyles. “Our premium quality of sports socks is called NIK. For women, we have the rose collection of sports socks. These are the best quality socks, for sports with competitive pricing and quality. There’s no wellness style quite as persistently recurring as the stretchy, body-hugging one-piece. There’s a practical reason why yogis have worn bodysuits for decades: Form-fitting one-pieces stay put during poses. Not to mention they’re comfortable and flattering, too,” says Harsh Saraf, Business Development Head, Super Knit Industries. However educating the customer on quality is a challenge. The general perception is that a well known brands have the best quality, or higher the price, better the quality. “So to convince the mass to go for a product with quality and good pricing is the biggest challenge. Another factor involved is the mindset that an international brand has better quality and longevity over the local Indian brands,” adds Saraf. In fact the impetus has been the International Yoga Day celebrated on 21 June that has opened up doors to 175 countries who will celebrate this day. “In the USA – $30 billion/annum growing at 20% on CAGR, not even a single brand from India in that space to take a pie, so this is a space that makes business sense,” adds Amit. Again with new age players like Foreveryoga and Bhu:sattva, wellness clothes are also getting trendy and in vogue. TGlobal fashion is ruled by going green. People are becoming increasingly sensitive to chemicals and find organic clothing very effective in making them comfortable. Wearing ethically correct attire makes person a conscious and responsible individual contributing toward a safe environment for the next generation. “People, now-a-days are informed and concerned about their health and family more than ever before. More informed buyers are looking for symbols of eco-friendliness or at least for information on the contents of the materials used in garment production. Organic is in vogue today because of its eco- friendly approach towards our society and has blended with our current trends in fashion and living completely. The latest trend right now is organic clothing! In other words, it’s a global fashion movement of going green. An eco-friendly fashion trend, quite a few high-end designers insist on having a collection of organic clothing for the environmentally conscious consumers. While organic clothing mainly involves the use of organic cotton, other alternatives include organic fabrics made from soy, corn, bamboo, etc. 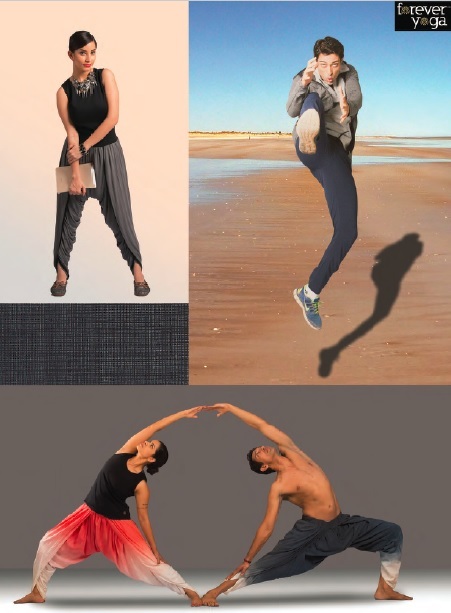 Comfort is one principal characteristic of organic clothing,” says Jainam. This story appeared in Apparel July 2016 here: Apparel – July 2016 – Industry Insights – Wear Fit, Stay Fit!